Product information "Monitoring System 100 DC"
The Monitoring System 100 DC is an Ethernet-enabled solution for the remote monitoring of telecommunication and energy supply infrastructure. It also serves the holistic monitoring of existing industrial infrastructure. Simply select the desired power supply on the right-hand side. With the optionally available DIN rail adapter, this IP based remote measuring and monitoring device can also be mounted on a DIN rail. Developed as a classic monitoring device for the 24x7x365 monitoring of mission-critical infrastructure, the Monitoring System 100 DC has been consistently dispensed with fans or mobile hard disks. Users of the Monitoring System 100 DC have an internal temp sensor for real-time measurement of the internal temperature in the housing. In addition, a second sensor monitors the DC voltage. The Monitoring System 100 DC works "out of the box", i. No software must be installed on the notebook, PC or server to operate this IP-based monitoring system. With full SNMPv1, SNMPv2c and SNMPv3 support, this monitoring system can be integrated with SNMP-compatible measurement data tools, DCIM or network monitoring software. To do this, simply load the SNMP MIB file from the multilingual web interface of the monitoring unit. The measured sensor data recorded in real time is then (remotely) transmitted via TCP / IP network to the automation or management software. Depending on the requirements, the user can individually assemble a tailor-made solution for IP-based room / building monitoring. The precise sensor temperature is already included with the monitoring device, so you get an IP thermometer. By RJ11 / RJ12 patch cable, this sensor can be extended up to max. 100 meters (328 ft). As soon as the sensor equipped with an SNMP OID has been connected to the monitoring unit via Plug and Play, it will be displayed in the multilingual web interface and the data recording will be started automatically. The factory-calibrated temperature sensor can even be fine-tuned if desired. The sensor data stored in the built-in datalogger are graphically displayed directly in the HTML5-based web interface. The measurement data required for checklists, reports and verifications are loaded directly from the IP-based measuring device at the click of a mouse. In addition, the device can send the measurement data records regularly via e-mail or FTP upload. 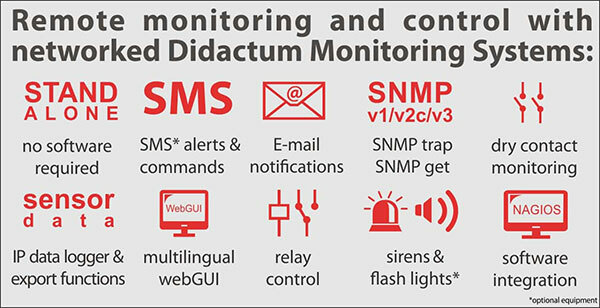 English-language installation instructions for Didactum's intelligent IP sensors are available at https://www.monitoring-hardware.com/. This IP based remote monitoring system is equipped with a CAN port. 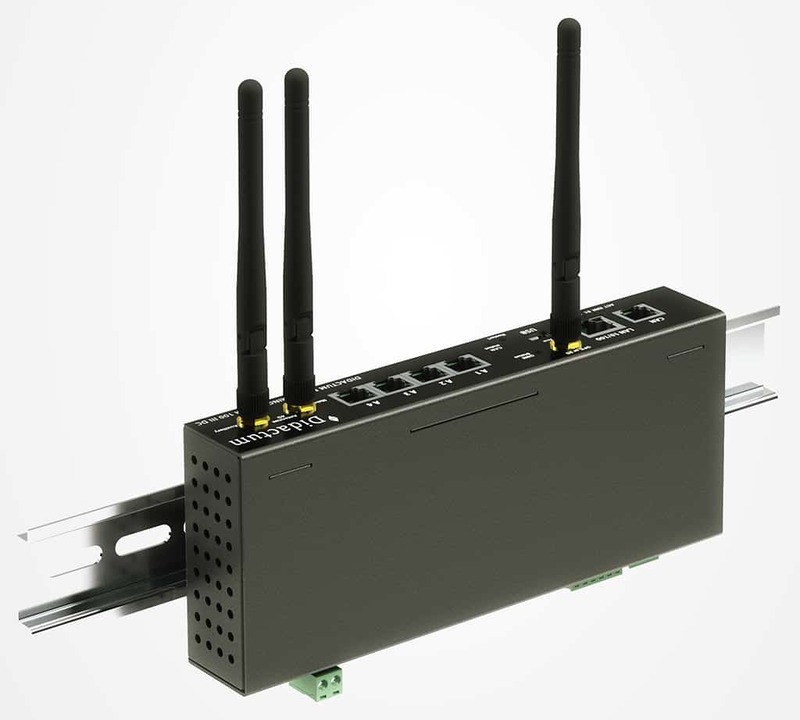 CAN (Controller Area Network) is a proven industrial fieldbus system. Both the SNMP-compatible multi sensors and CAN units from Didactum can be connected to the CAN port. If you need additional dry contact inputs, simply connect the CAN unit for up to 64 digital / dry contacts. If you would like to connect additional IP sensors to your remote measurement and monitoring device, simply attach the optional sensor box with 8 sensor ports for analog sensors. The Monitoring System 100 DC takes over the power supply of all connected sensors and expansion units. For each IP sensor connected to the Monitoring System 100 DC, individual limits and thresholds ​​can be defined in the web interface. In addition, each intelligent sensor can be named individually (for example, temperature sensor control cabinet). Thereafter, the notifications and alarms required in the context of room / building monitoring are stored in the integrated logics of the remote monitoring system. Critical events (smoldering fire, power failure, water damage, burglary) or state changes (voltage deviation, overtemperature, heat, dew point formation) are sent by the monitoring unit by e-mail (to up to 10 different recipients) or by SMS (via LTE or GSM modem or 3rd Party Email to SMS Gateway) to Facility Managers, or external service engineers. At the same time, the monitoring system sends important event messages in the form of traps via LAN / WAN to higher-level, SNMP-compatible automation and building monitoring software. With the support of the automatic relay circuits, sirens are switched on and messages forwarded to the building management system. All actions and events are recorded in the integrated SYSLOG database. This SYSLOG can be sent at regular intervals by FTP upload directly to the company headquarters / control room and evaluated from there. The Monitoring System 100 DC interesting features such as virtual sensors, PING features as well as extensive trigger and timer functions. An integrated hysteresis function allows a significant reduction of notifications and alarms in the case of continuously changing sensor states (slightly critical / critical measured value). Another highlight is the alarm card function built into the web interface. Here, the user can upload the floor plan of the infrastructure directly into the monitoring system. Then simply insert the installed sensors into the the map. If one of the sensors signals a critical condition / measured value, this is displayed flashing on the floor plan. The responsible service technicians and facility managers can respond even faster using the alarm card functions. Related links to "Monitoring System 100 DC"
Scope of delivery: Didactum Monitoring System 100 DC with internal 24V or 48V DC power supply. Interface: HTML-5 WebGUI. Multilingual. Configuration via web browser (Internet Explorer is NOT supported). Customer evaluation for "Monitoring System 100 DC"